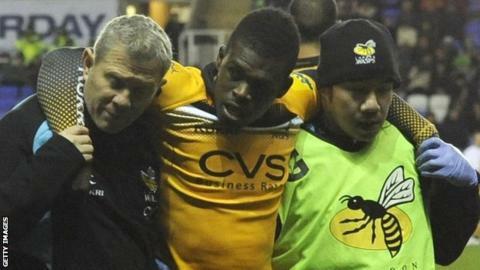 London Wasps wing Christian Wade has been ruled out for six months and has become the latest casualty for England's Six Nations campaign. The 22-year-old requires surgery after damaging ligaments in his left foot during his club's Premiership on Saturday. England had already lost flanker Tom Croft, who is out for the season. And Ben Foden, Alex Corbisiero, Geoff Parling, Manu Tuilagi and Marland Yarde are all doubts for the Six Nations. Wade had only just returned from the hamstring injury which ruled him out of the autumn internationals against Argentina and New Zealand. "It is devastating news for both the player and the club," Wasps director of rugby Dai Young said. "Christian was hugely unlucky to miss out on being capped this autumn with England and he had hoped to push on and put in some good performances for Wasps to get him in contention for Six Nations selection. "It is a huge blow for him, but he is a young player with a huge future and his time will come around again." Wade's injury leaves England head coach Stuart Lancaster with a selection dilemma on the wings, with Northampton who has played in that position for his country recently, expected to be out for 12 weeks with a knee injury, and likely to be sidelined for a similar period with a hip problem. On top of that there are major doubts over Leicester second row Parling (elbow) and centre Tuilagi (hip), and Saracens' Joel Tomkins (knee), who are all likely to miss England's opening fixtures against France on 1 February and Scotland on 8 February but may return later in the competition. Saints prop Alex Corbisiero is in danger of missing the whole tournament after having a knee operation which has ruled him out for an "undetermined" period of time. Meanwhile, in better news for Wasps, wing Tom Varndell has returned to training and is expected to be available for selection from mid-December.